Pattern Sizing: 8-18. I cut the 14 and graded out to the 16 from the waist down. I was inspired by this Isabel Marant top from Net-a-Porter.com that retails for a whopping $1,155! I used a faux suede fabric from Hancock that I purchased on sale for around $3 and some change per yard. Sure, a genuine suede top like the inspiration version above would be TO DIE FOR FABULOUS! 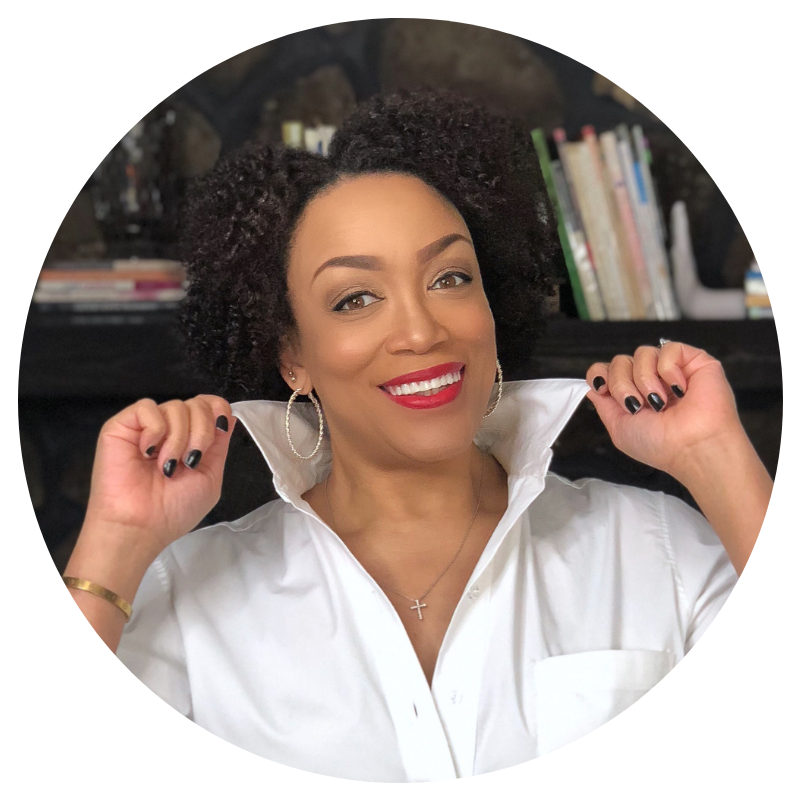 But even if I were willing to shell out a mortgage payment, I would feel like I could only wear that top on "special occasions". Mine will be a great t-shirt alternative AND it's machine washable. So I won't have to seek out a leather specialist dry cleaner! Same look with much more wearability! GO ME! This top practically sewed straight out of the envelope. I only added an inch to the hemline after cutting the size 14 from the shoulders and grading out to the 16 from the waist to the hip. I used my pinking blade in my rotary cutter so I didn't have to bother finishing the seams. This top was cut and sewn before Laura was auf'd on "Project Runway"! Pattern Sizing: 4-18, I cut the 16. Description: Fitted, tapered or straight-legged jeans (below waist) have shaped waistband with hook/eye closure, carriers, front/back pockets, back yokes, and binding for front fly zipper closing. Topstitching and narrow hem. Between making Vogue 8330 and Jalie 2908, I'm pretty familiar with this style of jeans and jeans in general. I use a 100% cotton, 21 wale cord in a bright turquoise color. I'm sure you didn't think I was done with my brightly colored pants! These were pretty simple to sew, almost just like the Vogue 8330. And with the same waistband issues as well. I've been spoiled by contoured waistbands and feel that all pants should have them! I ended up doing a "gaposis fix" and adding a small amount of length to the pattern. Overall, I love this outift. It's my answer to jeans and a t-shirt! Another great look! Like how you are working the trends! A spectacular outfit! 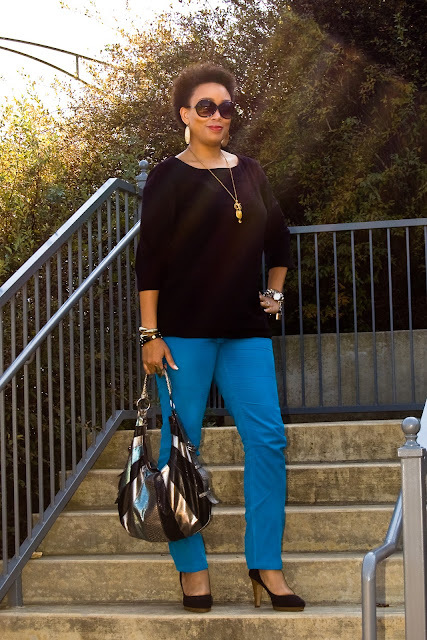 Keep those bright colored pants coming---they look great!!! 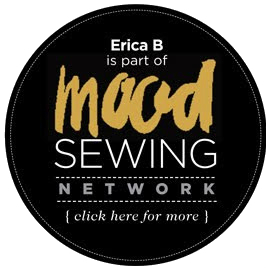 You get more sewing done in a month than I do in a year! This outfit looks fabulous. Could you explain a "gaposis fix?" The one and only pair of jeans I made had a huge gap in the back. Thanks Foster. Use the link I provided. Those are great pictures and worth a thousand words. A very nice alternative to jeans and a tee. I love the whole look! I need to make some bright colored jeans. I love all the pants you have been making. Fabulous outfit; both the top and the jeans! Beautiful outfit! I love the colour of the jeans and the way you take expensive items and make the look affordable. This is brilliant. Another example of showing the rest of us how to look terrific day-to-day. These outfits move your work from just admire to copy, from trend spotter to trend leader. So much appreciated. The whole package is terrific. I love the things you made and I love the way you wear them. 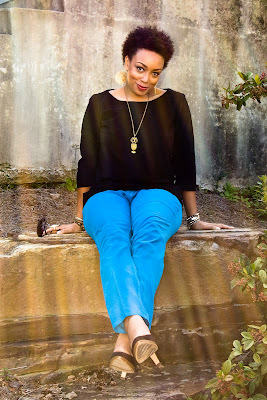 I love your interpretation--what a great idea with the contrast of texture and color... and that necklace is too cool. Your outfit is the epitome of casual elegance - I love it! Great outfit! I am inspired to try some jeans now. My first try didn't work out in the waist...Love those colored jeans and the top is really nice. Another fabulous outfit! 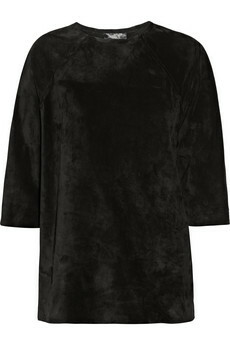 I'm always intrigued when I see suede and leather tops on sites such as Netaporter. It makes me realise how different some people's lives must be from mine if they can spend $1155 on a top (gasp) and which you can't wash.
Great outfit!!!! I like how you are using the faux suedes and leather. 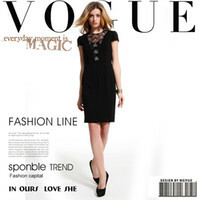 New Look 6083 has just entered my sewing to do list. Love what you did with it. Curious about the gaposis fix for the pants, tho! Me too, love real suede but not the thought of paying for it to be cleaned. super cute with the bright blue pants. And your new hairdo is super fresh. Fantastic look, love it from head to toe! I'm all for wearability too, your top will last longer and is much more versatile than the inspirational one!